Filed under: Helping You Shop! Most Japanese dishes depend crucially on quality ingredients. In Toronto we were constantly frustrated by not being able to find the right cut of meat for our Japanese recipes. Not to mention the fact that factory farmed meat is bland, unhealthy and cruel. Luckily we found the first and only Japanese butcher in Toronto. Not only do they provide the exact cut that you need on demand, but all the meat is naturally and ethically raised with regard to the animal’s and your own well being. So what did we do? We pinned down Seiko of FãMu and demanded an interview for japanesefood101.com. Well, it was more like we asked politely but you get the idea. 1. Tell us a little bit about yourself and why you started FãMu. I was born in the country side of Japan and have been living in Canada now for 10 years. Previously I worked mainly in the marketing field in Tokyo, Bangkok and Toronto. I love traveling and have been to more than 40 countries for both business and pleasure. I think of life as a story book which I get to write, and I’m writing an adventure novel! I enjoy cooking, eating and being in nature. My passion for cooking authentic Japanese food started on my search for high quality meats in Toronto. Unfortunately I had great difficulty, and that eventually led me start FãMu. Initially, I had zero background in butchering and no knowledge of the meat industry whatsoever, so I started reading all kinds of materials about butchering, meats and farms, asking a lot of questions at meat markets, and I started working part-time at the farmers’ market every Saturday to learn meat preparation. 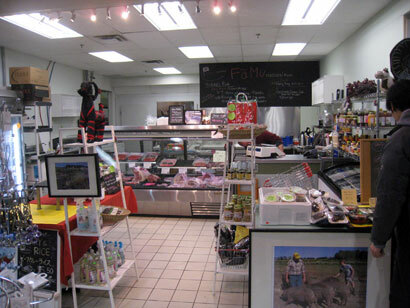 Finally, in July 2008, I opened up my own butcher shop, FãMu. I cannot deny admitting that there were many times when I questioned myself. If it is too mad to start FãMu, in fact, I spent weeks of sleepless nights! But I was somehow confident I was on the right path, and had never been so excited in my life. I have passion for good food, and had found great local farmers to partner with me in my venture. I am still learning everyday, and will keep learning. 2. What makes FãMu meat different than what you can get at a supermarket or regular butcher? The name FãMu is the Japanese pronunciation of the word ‘Farm’. And the name says it all. It starts with finding small, local farms that practice traditional raising methods. FãMu animals are pasture or free-run raised on mainly small farms in Ontario, and without chemicals, antibiotics, hormones or animal bi-products. It is a more labour and time intensive way to raise animals, but it creates tastier and healthier meats. Our chicken, turkey and duck are Omega 3 raised by Mennonite communities in Elmira, Ontario. FãMu Pork is Berkshire and occasionally Tamworth from Sebringville, Ontario. Our beef is Black Angus from Ayr and Rainy River in Ontario. And at last but not least, our Wagyu is from Kushu, Japan and Queensland in Australia. We carry only top quality meats, mainly pure bred and heritage head. I wanted to offer not just healthy meat, but also tasty meat. That eventually led me to carry more specified meat such as “Mennonite Roster”, “Berkshire Iron”, “Angus Beef”, and “Wagyu”. Another difference is that since we deal mainly with small local farms, and because of the natural growth cycle we sometimes have limited supplies and certain meats are available only periodically. We and our customers believe that’s the way meat should be consumed. 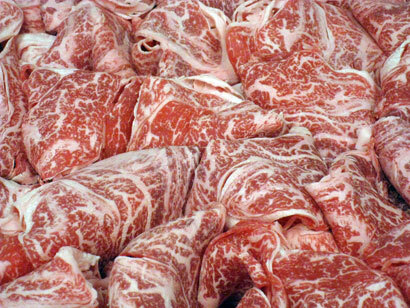 In addition we do custom cuts according to customers’ specification so you do not have to compromise the thickness of your steak or shabu shabu meat (thinly sliced meat for a Japanese dish). We also dry age our Angus and Ontario Canadian Prime Grade rail meat to maximize flavour and tenderness. Canadian Prime Grade rail meats are conventional though, carefully selected, picked up from the abattoir by myself. Dry aged meats are not watery, very tender, and are full of flavour. We also custom dry age pieces for your special occasions. Our Angus is pasture raised, not in a small factory like space. Berkshire Iron dwells in simple barns and has access to the outdoors, even in winter. They run around, play together in a field. Our birds are raised in a free-run environment and rest in a space three times larger than commercially raised birds. 3. Why do you choose to offer non factory farm raised meat? When I started living in Canada, I was shocked because there were so many people, especially children, with allergies and health problems due to junk food and all the chemicals contained in processed foods; and not only processed foods but meats and vegetables. Factory farm meat may be more cost effective, and can produce larger volume, but when I eat naturally raised meat, the difference is obvious. It tastes better, it’s more succulent, and it just feels right. I also believe that farm animals have the right to be raised in a humane way, and they deserve to be respected and appreciated throughout their lives. Offering local, small-farm raised meat is hard work and involves more steps, but knowing where our products come from and how they were raised give us confidence and pride in our products, and we know we are offering our customers something special. 4. What’s the story behind how you found your farmers and why you decided to work with them? As I mentioned, initially I didn’t have any meat industry or butchering background therefore I had no clue of all the different kinds of suppliers, and that was actually a good thing, because I could learn from scratch. I just knew that if I wanted quality, chemical and hormone-free meats, I needed to get healthy animals directly from local farms. One Sunday, I drove up to the St. Jacob area, found a “local farm map” at a tourist centre, called up one farm, then a second, and started visiting them one by one. I cannot even remember how many farms I called up and visited. But, after finally finding one farm that I really liked, the rest was easy. Good farmers know each other, so I just followed the chain of farmers raising their animals in the healthy and respectful way I love. I was very fortunate to meet the farmers that I met, and even though I had no experience they all believed in me and my dream to become a natural meat butcher. So it started. 6. Tell us a little bit about the Berkshire pig. How is it different and why is it popular? The field-raised Berkshire produces rich, dark meat with fat marbling that gives it a full flavour. It is also considered sweeter than commercially raised pork. It takes 8 months to rear them, as opposed to 6 months for commercially raised pigs. The meat needs gentle handling and works well with slow cooking. 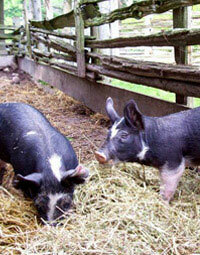 Many older people who are given Berkshire meat report that it tastes like pork they used to eat when they were young. As for myself growing up in Japan, I knew Berkshire by the name ‘Kurobuta’ (Black Pig) and it is very well known and popular there. Berkshire Iron is pure bred, originally from England, and has been a favourite of the British Royal Family since Queen Victoria’s time, (and with good reason). 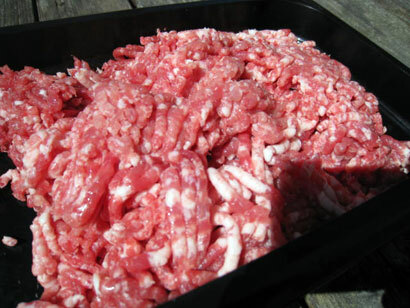 Berkshire pork ground fresh daily. 7. What is an Omega 3 chicken and why is it better? The Mennonite community who raises our chickens use a special formula to prepare the feed. It is absolutely chemical free, animal by-product free, and flax seed is added to make these chickens rich in Omega 3. These chickens take twice as long as commercially raised ones due to the natural protein levels in the feed. The meat actually tastes like chicken, has amazing flavour, tenderness and minimum shrinkage. Chicken bones from these chicken are one of our customers’ favourite because chicken stock made from this chicken is sweater, tastier and of course, heather! If you wish to have a chicken custom cut, we are happy to do that for you, so just let us know. We bring Turkey, duck and goose from the same community for holiday’s seasons. Please book ahead for your important family gathering occasion since there are only limited birds available. 8. What are some of the Japanese cuts that you carry and how do they differ from a regular butcher’s cut? In Japan, we thin slice all kinds of cuts. Depending on the usage and type of dish, we slice and cut meat to different thicknesses. This is essential to making authentic Japanese dishes. In Toronto, I could not find tasty thin sliced meat, and I wanted to make it available. In our display, we always have 6 kinds of ultra thin slice meats for Japanese cooking, three kinds of Ontario Angus Beef (Rib Eye, Shoulder and Brisket) and three kinds of Berkshire Pork (Loin, Shoulder and Belly). We also slice Wagyu upon request. If you have a dinner plan with many friends or family members, please call ahead, so that your order will be ready for you to pick up. We also do custom cuts upon request. Just ask one of our staff what you are looking for or which dish you want to cook, then we will suggest the best cut and prepare it for you. Because of limited display space for all cuts from whole animals, we only display the 6 popular cuts, but we most likely have what you looking for. Just ask! 9. What are your 3 favourite Japanese meat dishes made with Japanese cuts? 10. Do you have any other locations? What are your future plans for FãMu? FãMu at J-Town is the first and currently the only location. If we successfully gain awareness among a larger audience who share the same philosophy, I would love to have the second and possibly more locations in the future. This way we can source more farmers who raise animals naturally and with respect, and also service more customers seeking good healthy meat. (*J-town, located in Markham is the only Japanese Market in the Toronto area. 3160 Steeles Ave, between Victoria Park and Woodbine. Website: http://www.jtown.ca ). 11. Do you have any parting thoughts? I’d like to share some suggestions for what to serve at a gathering. Berkshire loin roast (with skin cracking) to impress the boss. Shabu-shabu or sukiyaki for close friends. When you share a meal from the same pot, you feel closer with your friends, really! And best of all, you don’t have to cook anything in advance, every one cooks together! Hassle free. If you want something a little more posh, serve Wagyu steak for a small party. Grilling Wagyu is easy, and no matter how you cook it, it’s delish! For a family gather go with braised or roasted Chicken. Consuming food is a fundamental behaviour for our lives and essential for our daily routine. I am not sure when we start feeding ourselves unnecessary quantities of junk food and processed food, but I think many of us have realised we want to get back to good wholesome sources. Quality of food, not necessary quantity of food, makes people happy and healthy. I believe everyone, you, your family members and your friends deserve to have the best quality food possible. While I knew it made a difference how an animal is fed and raised I never made the connection to the allergy and health issues you mentioned. It is getting harder and harder to find food that you can enjoy without worrying about how it will affect you down the road. Thank you for the great information. Wow. What a great interview. I live in Japan and though it’s obviously not hard to find meat cut in the styles Mr. Seiko describes, the quality of meat we get from our local supermarket sounds like it doesn’t come close to ファム. However, there is a small local butcher in town. I’ve never been there, but after reading this interview I’m going to give it a shot.